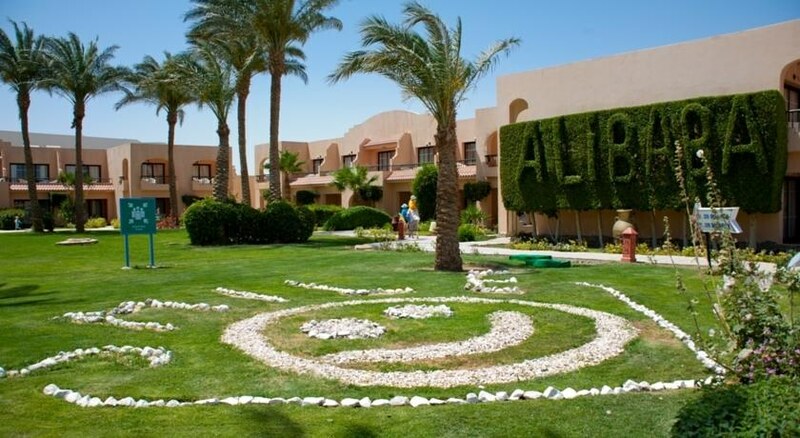 Ali Baba Palace is a 4-star family-friendly resort boasting its own private beach area, one of the largest swimming pools in Hurghada, a diving centre, as well as an aqua and water sports centre. Featuring luxurious amenities like a spa offering massage sessions, hot tub and steam room, the property invites guests to relax in comfort with excellent guest amenities and warm Egyptian hospitality. The tastefully furnished, air-conditioned rooms and suites at Ali Baba Palace are brightly painted and come with floor-to-ceiling windows and come with satellite TV, minibar, Wi-Fi (chargeable)and safe deposit box. Wi-Fi is available for an additional charge. 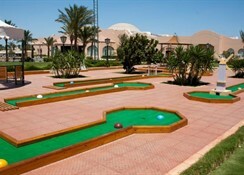 Guests can indulge in sports like beach volleyball, bowling centre, mini golf, snorkelling and tennis. Based in the quiet neighbourhood of Safaga Road in Hurghada, Ali Baba Palace is adjacent to a lovely private beach. 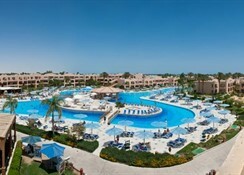 From the Sand City Hurghada the hotel is 1.8km; the Senzo Mall is a short walk away at 1.7km. Distance to Jungle Aqua Park is 2.1km. 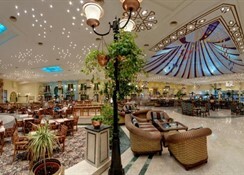 The hotel is 13km from Hurghada International Airport. There are several types of rooms at Ali Baba Palace to suit varying requirements of guests. The rooms come in categories of Deluxe Double, Double with Pool View, Triple and Double with Aquapark access. The brightly painted guestrooms come with floor-to-ceiling windows and include satellite TV, minibar, Wi-Fi (chargeable)and safe deposit box. There are balconies providing gorgeous sea or pool views. Ali Baba Palace has several bars and restaurants catering to guests’ palate. There is a main buffet restaurant that serves local and international cuisine for breakfast, lunch and dinner. 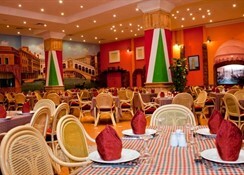 There is also a buffet Italian eatery with fine ambience serving all major meals. The other restaurant serves Oriental cuisine. There are several bars including a pool bar where guests can relax with a cocktail. Ali Baba Palace has a private beach area and a lovely outdoor pool and sun terrace where BBQs can be arranged. There is a fitness centre for those who wish to stay active. A delightful spa provides several rejuvenating massages and therapies. 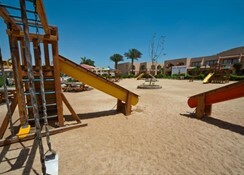 Kids will love its playground, waterpark with fun slides and kid’s club. The hotel arranges evening entertainment programs too. 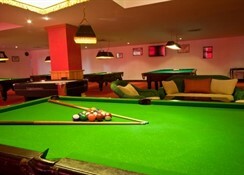 Table tennis, games room, darts can be access free while tennis, table tennis, billiards, diving and snorkelling can be arranged at extra charges.